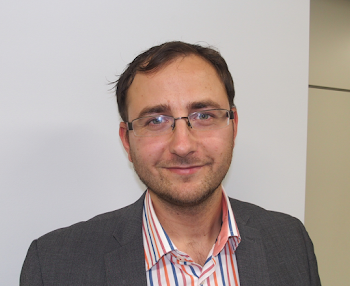 Huťko´s Technology Law Blog: Is There Any Union Wide Secondary Liability? Is There Any Union Wide Secondary Liability? In course of preparing my notes for the lecture on 'Website blockig', which I will hold in Brno in two weeks at Cyberspace conference, I bumped to several interesting things, which provoked the question formulated in the headline of the article. 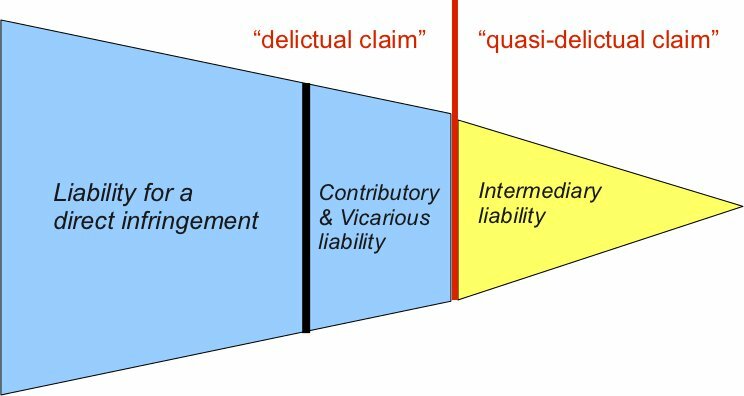 Yes, the intermediary liability is something I just made up here to reflect the art. 8(3) of Information Society Directive and art. 11 of Enforcement Directive, so please bear with me for a while. The common view in European Union is that although we have certain absolute rights harmonized (even unified), the secondary liability standards are up to member state's law. So for instance, if the absolute right of the author to distribute his work is infringed, the Union law will determine who is the direct infringer, but the member state law will have to determine secondary liability. So for instance, aiding the infringement of direct infringer would have to be determined under e.g. French or German law. Theoretically, France and Germany could have different standards for what triggers the secondary liability and thus applicable law could lead to different result about who is secondary liable. For instance, the French law could regard aiding to be infringing if its at least negligent contribution to the direct infringement and German law could require aiding to be intentional contribution of such a kind. The secondary liability thus even in the field of copyright and industrial rights is seen as merely 'local issue', most of the time based on the local general tort law. 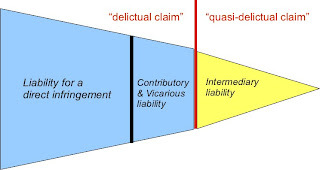 Next common view is that intermediary liability (based on art. 8(3) InfoSoc, art. 11 IPRED), as a type of secondary liability, does not lay down substantial standards, and thus its upon the member state to determine when the intermediary liability is being triggered. The intermediary liability is only liability to cease and desist, and to remove the infringement. 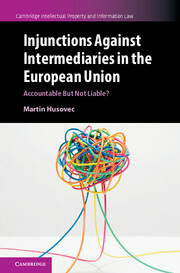 Therefore again, two countries could set up different requirements for intermediary liability (and EU countries did). The requirements of art. 3 IPRED are seen only as limitations of such a liability and not as the determinants of its scope. In other words, according to common view, countries are in compliance with the directive as far as they provide for some claims and do not provide them against said set of requirements. The common view is based on recital 23 of IPRED. (23) Without prejudice to any other measures, procedures and remedies available, rightsholders should have the possibility of applying for an injunction against an intermediary whose services are being used by a third party to infringe the rightsholder's industrial property right. The conditions and procedures relating to such injunctions should be left to the national law of the Member States. As far as infringements of copyright and related rights are concerned, a comprehensive level of harmonisation is already provided for in Directive 2001/29/EC. Article 8(3) of Directive 2001/29/EC should therefore not be affected by this Directive. a) primary liability (liability of direct infringers) - in some IPR fields Union law (e.g. copyright, trade marks). 24 The notion of ‘distribution to the public ... by sale’ in Article 4(1) of Directive 2001/29 must accordingly, as observed by the Advocate General in points 44 to 46 and 53 of his Opinion, be construed as having the same meaning as the expression ‘making available to the public … through sale’ in Article 6(1) of the CT.
25 As observed by the Advocate General in point 51 of his Opinion, the content of the notion of ‘distribution’ under Article 4(1) of Directive 2001/29, must moreover be given an independent interpretation under European Union law, which cannot be contingent on the legislation applicable to transactions in which a distribution takes place. 26 It must be observed that the distribution to the public is characterised by a series of acts going, at the very least, from the conclusion of a contract of sale to the performance thereof by delivery to a member of the public. Thus, in the context of a cross-border sale, acts giving rise to a ‘distribution to the public’ under Article 4(1) of Directive 2001/29 may take place in a number of Member States. In such a context, such a transaction may infringe on the exclusive right to authorise or prohibit any forms of distribution to the public in a number of Member States. 27 A trader in such circumstances bears responsibility for any act carried out by him or on his behalf giving rise to a ‘distribution to the public’ in a Member State where the goods distributed are protected by copyright. Any such act carried out by a third party may also be attributed to him, where he specifically targeted the public of the State of destination and must have been aware of the actions of that third party. 28 In circumstances such as those at issue in the main proceedings, where the delivery to a member of the public in another Member State is not effected by or on behalf of the trader in question, it is therefore for the national courts to assess, on a case-by-case basis, whether there is evidence supporting a conclusion that that trader, first, did actually target members of the public residing in the Member State where an operation giving rise to a ‘distribution to the public’ under Article 4(1) of Directive 2001/29 was carried out and, second, whether he must have been aware of the actions of the third party in question. 36 The application of provisions such as those at issue in the main proceedings may be considered necessary to protect the specific subject-matter of the copyright, which confers inter alia the exclusive right of exploitation. The restriction on the free movement of goods resulting therefrom is accordingly justified and proportionate to the objective pursued, in circumstances such as those of the main proceedings where the accused intentionally, or at the very least knowingly, engaged in operations giving rise to the distribution of protected works to the public on the territory of a Member State in which the copyright enjoyed full protection, thereby infringing on the exclusive right of the copyright proprietor. Its not easy to deny that this paragraph is a part of the interpretation of the autononoums concept of the 'distribution right' because nobody would probably doubt that the other part about 'targeted the public of the State of destination' is part of such autonomous test under the Union law. I am really wondering what this means, not only for the other economic copyright rights such as 'the communication to the public', but also for the trade mark law for instance. Is it now up to the CJEU to decide whether the act of contributing to the infringement triggers secondary liability? Plus, for countries where for instance contributory liability is dependent on the intent to aid the infringement, does this mean that they have to lower the standard for the copyright law, or at least infringement of the right to distribution? What about joint and several liability of direct infringer and of contributory infringer? All these questions might seem to be preliminary, but who remembers what happened with one paragraph of Infopaq C-5/08 that was later repeated in next five cases, and possibly rewrote the European copyright term of a 'work', may know why I am asking these questions. 127 It involves determining whether that provision requires the Member States to ensure that the operator of an online marketplace may, regardless of any liability of its own in relation to the facts at issue („unabhängig von seiner etwaigen eigenen Verantwortlichkeit in den streitigen Sachverhalten”), be ordered to take, in addition to measures aimed at bringing to an end infringements of intellectual property rights brought about by users of its services, measures aimed at preventing further infringements of that kind. Smaller circle represents the effective and dissuasive intermediary liability as a minimal threshold required by paragraph 136 of L'Oreal v. eBay (above). The blue area is the difference between required minimum and possible maximum of intermediary liability. is there at all any such a blue area? or are minimal and maximal scope actually indentical? The latter would be answered in affirmative if the effectiveness and dissuasiveness of intermediary liability requires in fact its maximal scope. So for instance, if the German doctrine of Störerhaftung requires certain breach of the duty of care („Verletzung von Prüfpflichten”) to trigger the intermediary liability, is it effective enough? Actually, website blocking might be such a case. Lets says that under German doctrine, website blocking wouldn't be available because access providers do not breach any duty of care (compare LG Köln, case no. 28 O 362/10). And let's assume that CJEU would see ad hoc website blocking as a part of the maximal scope. Is German doctrine than effective and compliant with Union law if it can not reach the access provider? Certainly interesting to ask, but still not conclusive on whether "mininal = maximal". I am not making up this scenario artificially. Website blocking as you might know is making its way to CJEU in a reference of Austrian court in case UPC Telekabel Wien C-314/12. 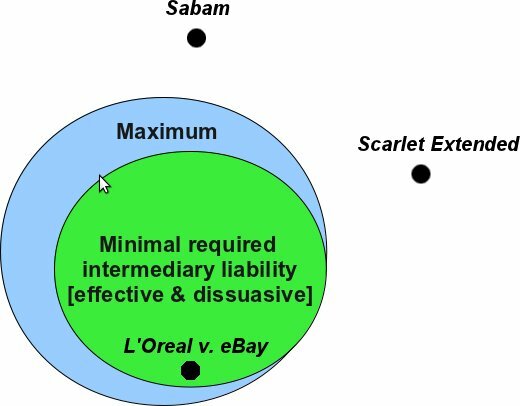 As can be seen on the picture above, the cases Scarlet Extended C-70/10 and Sabam C-360/10 represent injunctions that are outside of the scope of intermediary liability, and the injunctions applied for in L'Oreal v. eBay C-324/09 represent core minimal scope of intermediary liability. It's interesting to see where at the picture would be UPC Telekabel Wien C-314/12 according to the CJEU. What is your take on this? How do you read these lines? FN 19 – Contributory liability for trade mark infringement has developed as a judicial gloss on the Lanham Act of 1946, which governs trade mark disputes in the United States, although not expressly provided in the act. See 15 U.S.C. § 1051 et seq. ; Inwood Laboratories, Inc. v. Ives Laboratories, Inc., 456 US 844, 853‑55 (1982). Since Ives, contributory infringement suits in the United States have been brought under the Lanham Act, rather than under tort law. See, for example, Optimum Technologies, Inc. v. Henkel Consumer Adhesives, Inc., 496 F.3d 1231, 1245 (11th Cir. 2007); Rolex Watch USA v. Meece, 158 F.3d 816 (5th Cir. 1998); Hard Rock Cafe Licensing Corp. v. Concessions Services, Inc., 955 F.2d 1143 (7th Cir. 1992). Even in the United States, however, contributory liability for trade mark infringement is seen as closely related to general liability law. When applying the United States Supreme Court’s language in Ives, courts ‘have treated trade mark infringement as a species of tort and have turned to the common law to guide [their] inquiry into the appropriate boundaries of liability’ (Hard Rock Cafe, 955 F.2d at 1148). As a result, courts differentiate between contributory infringement and direct infringement and generally require proof of additional factors imported from tort law in the contributory liability context. See, for example, Optimum Technologies, 496 F.3d at 1245. FN 20 – See, as regards France and the Benelux countries, Pirlot de Corbion, S., ‘Référencement et droit des marques: quand les mots clés suscitent toutes les convoitises’, Google et les nouveaux services en ligne, dir. A. Strowel and J.‑P. Triaille, Larcier, 2009, p. 143.